Forget the iPhone taser application… here’s the real thing! 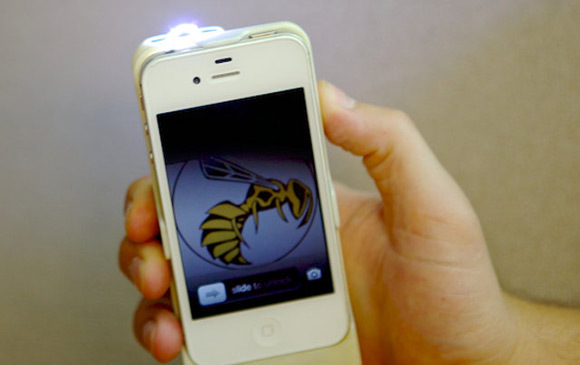 Seth Froom came up with the idea for the “Yellow Jacket iPhone” case after an armed robber broke into his house and stole cell phones, laptops, and other electronic devices. He wondered how the situation could’ve played out differently if he had some form of protection. Froom and co-founder Sean Simone are currently fundraising on Indiegogo to make Yellow Jacket a reality. What happens when you try to put the thing next to your face? Are we going to have people inadvertently stunning themselves? Apparently the Yellow Jacket “features a safety switch and a rotating electrode cap, both intended to prevent accidental discharge”. Haha. We’ll see. They are currently at $31,794, and have 12 days left to reach their goal of $100,000.